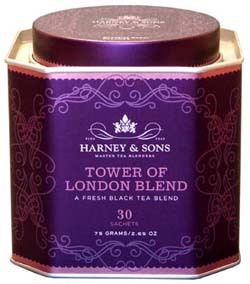 The Tower of London Blend features Chinese black tea infused with honey flavor. The decorative tin is filled with 30 of Harney & Sons's distinctive triangle-shaped silken sachets, each of which will brew a perfect 12oz up of tea. This blend of tea contains caffeine.